This entry was posted on Sunday, June 12th, 2016 at 10:03 pm and is filed under Uncategorized. You can follow any responses to this entry through the RSS 2.0 feed. You can leave a response, or trackback from your own site. 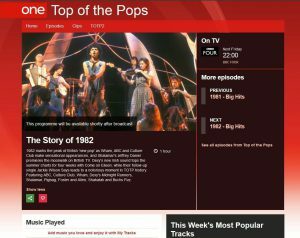 Several members of Pigbag were interviewed for the BBC Four TV programme “Top of the Pops: The Story of 1982”. The programme will be broadcast on Friday 17th June 2016 at 22:00. 1982 was the year Pigbag reached number 3 in the UK Singles Charts with “Papa’s Got A Brand New Pigbag”, so it’ll be interesting to see what the band members have to say, particularly about their Top of the Pops appearances. They were allegedly banned from appearing after some high-spirited “misbehaviour”.